This is the famous painting presented as a greeting card with envelope that Ramakrishna saw that led to his experience of Jesus merging with him. It was at his friend Jadulal Mallik's garden house where Ramakrishna first saw this painting. 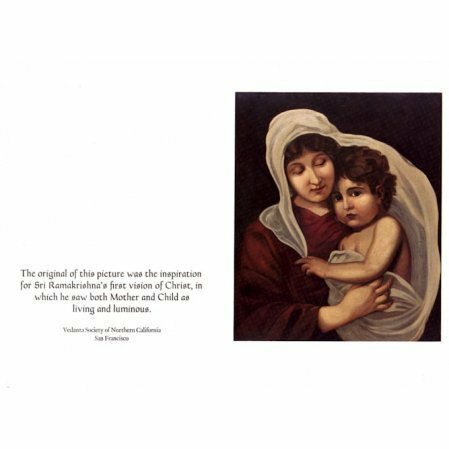 He intently studied the image of the Madonna and Child thinking of the wonderful life of Jesus. Rays of light emanated from the bodies of Mother Mary and the child Jesus, entering Ramakrishna's heart. The overpowering experience forced Ramakrishna to forget his Hindu awareness. He even forgot to visit the Divine Mother in the temple so strong was his love of Christ. (You can read the full story starting on page 356 in Sri Ramakrishna and His Divine Play). Many years later, Jadulal Mallick had died and the estate was up for sale. Swami Ashokananda who was then head of the Vedanta Society of Northern California arranged to purchase the actual painting that Ramakrishna looked at. This print is a copy of that painting, now on view in the monastery. 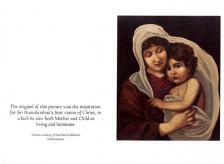 We offer both a print of the painting, and a greeting card with envelope.